The Paracetaceans are actually a group of mammals that are not related to modern cetaceans, but actually evolved from elephant shrews, much like the therapeds and Deinognathids. However, this branch went a totally different way. These animals developed flippers from what was left of their limbs and took to the water. They have long, flat tails and swim by moving the tail from side-to-side, much like fish do, rather than up and down like modern cetaceans. The family Pelagiidae are entirely aquatic, never retreating to land. The flippers are pleated in most species, instead of diamond-shaped like in most modern dolphins. Pelagius even still has claws on it's flippers. The basic body form is much like that of modern dolphins, the body is long and torpedo-shaped, they have flippers in front that are used for steering, and a flat, rudder-like tail. In some species, the tail is longer than in others. But unlike modern dolphins, these animals have fur that covers the body, more like seals or sea lions, instead of being naked like dolphins. They are also equipped with tiny flippers on the backside, just below the tail area. They have no external ears, and they usually have a long, slender beak. The nostrils are at the end of the beak, instead of on the head. The eyes are relatively larger than those of dolphins. They are very fast swimmers, and usually travel in groups, numbering as many as 500 individuals in some species. These animals basically prefer to inhabit open oceans, much like modern cetaceans. Other, closely related families, that actually descended from this family, can also travel on land, pulling themselves along with the help of their flippers, moving from one water hole to another. Or inhabiting lagoons, especially where there is an abundance of kelp or other such vegetation. But this family cannot do any of that, and find all the food and companionship they need in the ocean. These animals feed on fish, crustaceans, and cephalopods. Their beaks are equipped with small, stabbing teeth, which helps to grasp their slippery prey. The eyesight is mostly poor, except at the surface. These animals are not usually deep divers, and prefer to capture their prey at night, particularly when such creatures as squid come to the surface. Even in sheer darkness, these animals snap up the fast-moving squid with amazing accuracy! Because they do not hunt by sight alone. Like dolphins, these animals deploy the use of sound to locate prey. Among the most vocal members of this rather small family, is in the genus Loquax. These animals have more than 100 different vocalizations, but the main one is the one they use to hunt prey. Their sounds stun fish and other prey to a point where the prey becomes paralyzed. The prey cannot swim away, thus it is snapped up by Loquax. Most of the time, the prey is swallowed in one gulp, but these animals can attack prey about half the length of their own head and body. Prey this size is torn rapidly into chunks by the entire pod and then eaten. Much like we would see in wolves or wild dogs. Like today's whales and dolphins, there is a small, triangular fin on the back, the dorsal fin. This is present in almost all species in this family except Natacelus, which instead has a rather narrow ridge on the back where the fin would be at. But this animal still retains other dolphin-like qualities. These animals are fast and agile, often leaping half their body length out of the water. They are however not without predators of their own. Sea genets are among some of the worst enemies of these animals. Sharks also take their toll. For these sinecrus, their best defense is speed, and staying within a group. Below I have a rather crude sample of what these creatures look like. I have given 2 examples of species from this family. 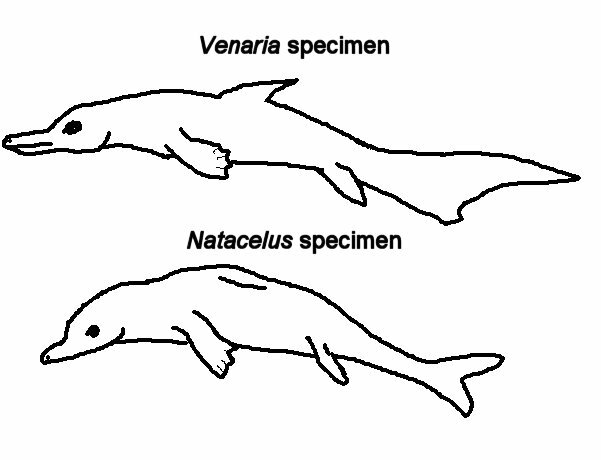 One is Venaria, which is a species most notable for it's paddle-shaped tail, and also has a small dorsal fin on the back. 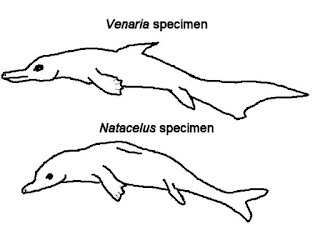 The other species depicted is Natacelus, which lacks the dorsal fin. Click on the pic to make it bigger. I have a question. On your Meet The Mammals page, there's only a description up for usually one of the animals on each page. Why? I'm sorry, I'm not sure what you mean. If there is only one animal to describe, it'll have only one description. If you clicked on one and you do not see the rest, scroll down, the rest of the descriptions should be there to click on. What I mean is, sometimes there's a page with multiple animals on it, but only one of the descriptions is working. Is it still doing that? It works for me. What web browser are you using? Nice, a cetacean equivalent. However, they are not really possible because of the swimming. I'm afraid a side to side motion would require a total reconstruction of the animal's spine, which is nigh on impossible. The entire synapsid body structure revolves around an undulating spine, to suddenly go to a side to side motion would be ridiculously hard. The only reason that synapsids were able to develop an undulating spine in the first place is because the amniotic ancestor was less biased towards either undulation or side to side than modern reptiles or mammals. The therapsids evolved an undulating structure and specialised to it instantly, meaning they could not grow back to side to side. Similarly reptiles specialised further to side to side, so most of them couldn't do undulation movement either. Also, they'd be better losing their fur for a fully aquatic lifestyle. Why aren't there any proper whale analogues in your project yet, like massive filter feeders or predators like sperm whales? These seem like good candidates, better than seals. Apart from that, they seem pretty cool creatures. I can't wait for you to reach, or even to exceed the 5000 mark. And I would love a post metazoica blog, which should be interesting. Actually dude, a lot of mammals use a side-to-side motion when they swim. As I understand it, elephant shrews are among those. Keep watching. I will be adding more animals to the new checklist very soon, and have the newest version available on my website soon too. The vast majority of mammals do swim in an up-and-down motion. The only mammals I can think of that do otherwise are the otter shrews of Africa, which ironically are related to the elephant shrews. I also heard the water opossum swims side-to-side.